The Boulder Rock Starter Kit is a compact pod system intended for use with high nicotine/salt based e-liquids that delivers an ultra convenient vape experience without breaking your bank in the process. Measuring in at just under 5 inches tall by not even an inch wide, the Rock Vaporizer from Boulder is one of the smallest around. It easily fits in a pants pocket for easy travel and can be concealed in the palm of your hand for discreet rips on the go. 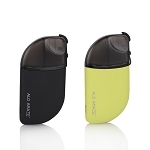 This easy to use device utilizes refillable pod atomizers that can hold up to 1.5mL of your favorite liquids. These pods utilize a classic yet effective kanthal/organic cotton coil and a leak-resistant easy fill design that allows you to refill in just seconds with no mess. Boulder incorporates a premium lithium-ion battery that is charged through an ultra convenient built-in USB charger that is always by your side as long as you have your Rock device. This battery also features a large 360mAh capacity that will keep you pumping out fresh clouds for days at a time before eventually needing a recharge. When the time to charge comes, connect the USB charger and you will be good to go in just 45 minutes. This device also sports a user-friendly one button operation that makes it as easy to use as it gets. Press and hold the single control key to activate the heating element or quickly press that button three times within two seconds to initiate the innovative locking feature for travel without misfires.